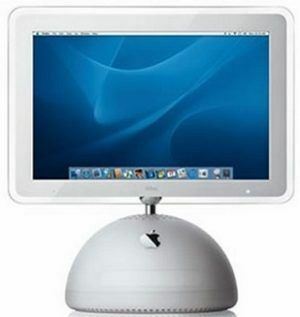 The iMac G4/800 has its hardware housed in a hemisphere about 10 inches high, while the 15” flat panel TFT monitor tops it on an adjustable steel arm. The iMac G4/800 features a 800 MHz PowerPC 7445 (G4) processor with the AltiVec “Velocity Engine” vector processing unit, 256 MB of RAM (PC133 SDRAM), a 60.0 GB Ultra ATA/66 hard drive (7200 RPM), a tray-loading 32X “Combo” drive, and NVIDIA GeForce4 MX graphics with 32 MB of DDR SDRAM (AGP 2X support). The fanless cooling is replaced with an internal fan. The internal speakers are swapped for the external optional ones. The model was available with Apple Keyboard and Apple Mouse. The pre-installed OS is MacOS X 10.2 “Jaguar”, the MacOS 9.2 boot is cut off. Introduced on: February 4, 2003. Video: 15″ TFT LCD, 1024 × 768 pixels resolution, viewing angle: 120° horizontal and 90° degrees vertical. Storage: 60 GB, 7200-rpm Ultra ATA-66 up to 128 GB Hard Drive Supported. Built-in microphone: Record sound or control your computer with spoken commands. Optical disc drive: Install software, use applications, and create your own music CDs. If you have the Combo drive, watch DVD videos. If you have the SuperDrive, you can make them, too. Apple Pro Speakers: Included with some models. Available separately. USB port: To connect a USB device. Power indicator light: Pulsing light indicates that the computer is sleeping. Volume controls: Use the keyboard to adjust sound volume. Media Eject key: Use to open the drive tray or eject a CD or DVD. Apple Pro Mouse: A precision optical mouse you can use on almost any surface, no mouse pad required. Kensington Security Lock: Attach a lock and cable to prevent theft. Headphones port: Connect headphones or analog speakers. Apple Pro Speaker mini-jack: Connect Apple Pro Speakers. FireWire: Transfer video from a DV camera. Connect an Apple iPod, external hard disk, or other FireWire device. Ethernet: Share files with another computer. Connect a DSL or cable modem to access the Internet. Power Port: Connect to a standard electrical outlet. Modem: Connect to the Internet, browse the World Wide Web, and send email. USB: Connect printers, Zip and other disk drives, digital cameras, joysticks, and more. VGA output: Connect an external monitor for video mirroring using the Apple VGA adapter (available separately). Power button: Turn your computer on or put it to sleep. To learn more about your iMac’s features: m Choose Mac Help from the Help menu, then click Go under Discover my iMac. Model No: M6498 (EMC N/A). As you might have already noticed, Apple enhanced not only a hard drive capacity but also the rotation-per-minute value. This is crucial for a computer quick performance and shortens the applications startup time. Not sure how to get the most out of your new iMac? Read on for a few ideas. Make your own CDs. Use iTunes to transfer and organize music from your CD collection, then burn your own custom music CDs. Transfer music to an iPod or other MP3 player to listen on the go. Make a movie. Shoot video on a DV camcorder and import it into iMovie. Then rearrange, edit, polish, and add titles and soundtracks. Make a DVD. If your iMac has a SuperDrive, use iDVD to burn DVDs for viewing in almost any home DVD player. Connect to the Internet to send emailand browse the Web, or use iTools to post digital photos to the Web for everyone to see. Browse through the next few pages to find out more. The iMac is your digital hub: You can send digital photos to friends and family. Watch a DVD movie or burn your own DVD. Put up to 1,000 songs in your pocket. Send email and surf the ‘Net. Import and edit home movies.Put up to 1,000 songs in your pocket.Listen to music and burn your own CDs. If your iMac has a Combo drive or SuperDrive, you can watch DVD movies. To watch movies, use the controller to play the movie or see the DVD’s special features – just insert a DVD video disc, and DVD Player opens automatically (To learn more about DVD Player: Choose DVD Player Help from the Help menu). To use the whole screen to watch the movie, you can choose Enter Full Screen from the Video menu. Trade in your old iMac at iGotOffer – Best Price Online, Free Instant Quote, Free Insured Shipping, Fast Payment: Sell your iMac. iMac G4/800 (Flat Panel, 2002) – this model’s hardware housed in a hemisphere about 10 inches high, while the 17” flat panel TFT monitor tops it on an adjustable steel arm.